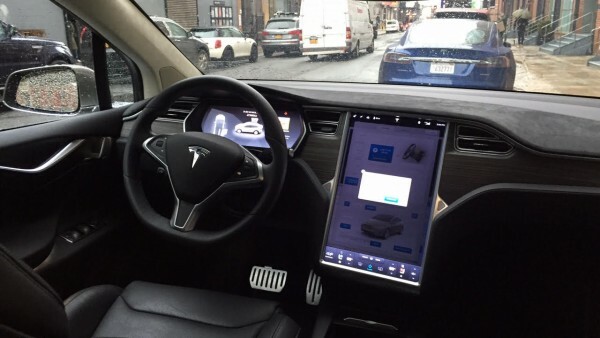 Stopped at the intersection of 14th Street and Ninth Avenue, one of the first Tesla Model X crossover utility vehicles to ever roam the streets of New York is hardly attracting any eyeballs. Perhaps that’s because lost tourists and harried commuters didn’t hear the Model X coming. That’s OK, because it’s still not clear yet if the Model X, essentially a taller and larger Model S sedan, will be the next big thing for the brand. Although our time with the Model X P90D — the fastest, 762-horsepower version — was short, our route still comprised cobblestone roads, highways (OK, we’re being generous calling the West Side Highway one), and the afternoon rush. Here’s what we learned during a quick loop around Lower Manhattan, sharing space with mostly oil-burning traffic. The Model X may be almost 800 pounds heavier than the Model S, but it feels like a projectile at the ready, from a standing start. You remember your first acceleration run in any Tesla because of its neck-snapping forward thrust, but the Model X feels more planted than the Model S to the ground as you step on the accelerator. The otherworldly sensation remains. Ludicrous mode is just that: Stomp on the “gas” pedal from a standstill and you hurdle forward faster than you ever dreamed. Acceleration once at speed is dulled a bit, like in the Model S, but the forward acceleration is still a great party trick. Will Model X family men and women need such a gimmick? No, but they’ll like it every time they show it off. All Model Xes are AWD, and they are available as 70D, 90D, and P90D, just like the Model S. There are still no immediate plans to build a Supercharger, which is capable of quickly replenishing the Model X, in New York City. 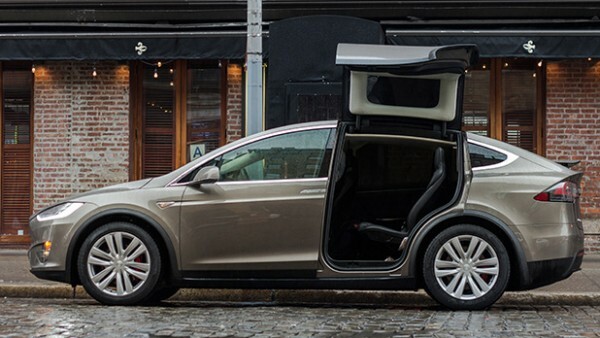 Press the door handle and the Model X’s doors open upwards and out within seconds. The “falcon doors” serve a very meaningful purpose. They’re a novelty concept that allows for easy access for child seats, the elderly, the disabled, and anyone with claustrophobia. Their size changes how you feel about the dimensions of the Model X. Press the door handle and the doors begin to slide up, then fold out and up. It’s like a Disney World ride. Like most minivans (and some other cars), the Model X can operate its doors remotely via the control screen, and at varying heights. It wouldn’t make for a good getaway car, because the doors take seconds before they’re open enough for anyone to climb in. Tesla says sensors will prevent the doors from hitting everything from the ceilings and walls of garages to errant youths. It’s not as big as you think it is. And it drives like a vehicle several sizes smaller. Sure, you can assign the term “minivan” to the Model X, and its slab-sided, grille-less design doesn’t do its shape any favors. But the Model X, which is about 10 inches longer than a Nissan NV taxi and about 10 inches shorter than a Chevrolet Tahoe SUV, feels nimble. Even the least powerful Model X will have at least 500 horsepower combined, and the most powerful Model X can trailer up to 5,000 pounds, a convenient feature when your other EV runs out of charge. When was the last time you used your Fiat 500e to tow anything? A peek inside: The motifs of wide-open spaces and digital everything of the Model S is reprised in Tesla’s first-ever utility vehicle. Under the skin, it’s still a Model S.
It’s not incorrect to say that the Model X is like a wagonette version of the Model S. They share a chassis, most pieces, and design — no trickery by design. It looks and feels like a Model S because, well, it’s very closely related to one. It’s still electric (duh) and has similar range and charging capabilities. Autopilot semi-autonomous drive and Summon are available, and watching autopilot guide the way through congested Manhattan traffic would make anyone grin. The price to take the Model X P90D home: $140,000.